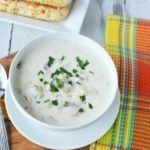 Warm yourself up with this deliciously creamy Ivar’s Clam Chowder! Cook the bacon until browned in a medium saucepan over medium-high heat, until cooked, but not crispy. Drain the juice from the clams into a separate bowl, and set the clams aside (you will need the clam juice for the next step). In the same pot that you browned your bacon, stir in the onion, celery, and potato, and add the reserved juice from the clams. Add just enough water to cover the vegetables (as shown in picture above), set the pan over high heat, and bring just to a boil. Reduce the heat to med low, cover, and simmer for about 20 minutes, until the vegetables are fork-tender. Next, melt the butter in a large saucepan and add the flour and cook, stirring constantly for 2 minutes. Whisk in the warm half-and-half, and continue whisking and cooking for about 5 minutes over medium low heat until the flour is cooked, and mixture is thickening and smooth (note – you can substitute milk here, but will lose some of the richness of this recipe). Once you have the half and half base down add all of the cooked vegetables AND their cooking liquids to the base. Add the clams you set aside. Lastly, season with salt, and pepper and parsley.